Early reveille shifting camp. Finally pulled out at 11.30. Whole brigade moving. Wonderful sight. Hundreds of lorries. Travelled over desert until 6.30. Dossed down for night. Reveille at 4.30AM. Convoy moved on again. Travelling all day until 5.30AM. 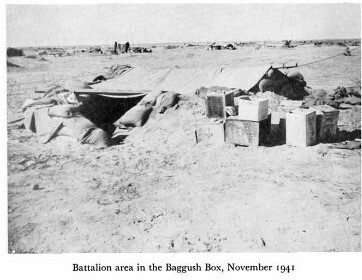 When arrived at Baggush Box (British Field Army fortification) pitched tents on escarpment. Station side ???. Can see Med Sea 3 miles away. On guard at night. About 30 miles from Mersa Matruh (sea port). Dug in tents – hard ground. Can get wonderful view of coastline stretching for miles. Marched to beach for swim in afternoon. Bayonet practice & squad drill in morning. Manouvers during afternoon. Terrible dusty. Getting very cold at night. Reveille at 5.30AM. Left camp at 7 o’clock. Brigade manoeuvres. Travelled in lorries all day having dawn attack next morning. Returned to camp at 9.30AM. Spent day cleaning gear & rifles. Early to bed. Jerry bombed siding at night hitting ammo train. Usual drill in morning. Had swim during afternoon. Visited YMCA at night. Short out but terrible climb back to area on escarpment. Held church parade in valley 1 mile from area. Swim again in afternoon. Went in lorries towards beach. Practiced attack with live rounds. Company manoeuvres in afternoon. I love the matter-of-fact nature of this diary (at least so far). “Jerry bombed siding at night hitting ammo train.” That must have been one almighty explosion but it’s just another line – as if this is an every day occurrence.